"Girl Rising gives students as young as ten the knowledge to help them raise their voice at the injustice that millions of young girls face everyday." My goal is to expose students to a wide variety of issues girls face in the world that prevents them from accessing quality education. In one course, Global Issues of the 21st Century, we use GR as a way to look at the UN Sustainable Development Goals, and we use it in our AP World History course to study current events. In AP World History, Girl Rising is taught and integrated into the curriculum throughout the year. Students watch the full Girl Rising film in class and are then assigned numerous in-class activities connected to the film. This includes the Roots of Gender Inequality activity, where students are asked to answer research questions that prompt them to think more deeply about the film and the barriers girls in all nine countries face in obtaining an education. When developing my own Girl Rising activities, I incorporate the “big themes” of AP World History rather than building off of, or incorporating, standard AP curriculum resources. These themes include: cultural oppression and social structures, displacement, education and climate change and poverty. View the Roots of Gender Inequality activity here. 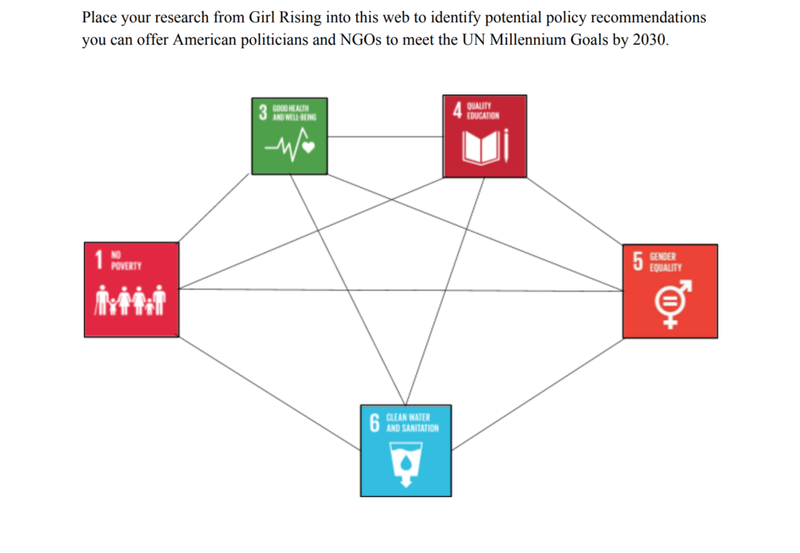 In Global Issues of the 21st Century, Girl Rising is used as part of our effort to integrate the United Nations Sustainable Development Goals into the classroom, specifically Goals 4 (Quality Education) and 5 (Gender Equality). One example is a project designed to encourage students to compel policymakers to invest more time and money in girls’education and empowerment. As with AP World History, students watch the Girl Rising film in class and assignments connected with the film are in-class activities. View the SDG activity here. What is the impact of Girl Rising on your students? They become more knowledgeable of the issues we need to collectively address. This film should be an essential core component of all social issue courses in middle and high school because it allows for students to better understand the world we live in and the great gulf of inequality that continues to exist. No, but I did have to get the Parent Teacher Student Association to purchase the film because of the price. Follow Chris's lead and request a Skype in the Classroom session from Girl Rising.